Since 1999, David Altman has been representing seriously injured people and their families throughout Massachusetts. David has recovered millions of dollars for people injured in cases ranging from simple negligence to the most sophisticated and complex liability cases. 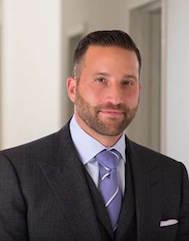 As the managing partner of the firm’s personal injury practice, David also oversees the other attorneys and staff at the firm in order to ensure that every case gets the attention it deserves. While David has developed a reputation for achieving consistently outstanding results on behalf of injured people, he is probably best known for the level of service he provides. He makes it clear from the beginning that, while he will always be a trusted adviser, the client is in control of all decisions, from whether to accept a settlement, file a lawsuit, or go to trial if necessary. David is available 24 hours a day, and is always willing to take a call from a client. After representation on a particular case has ended, clients often find that they consider David not just an adviser, but a friend. Away from the office, David enjoys spending time with his family, and coaching youth sports. He is an avid fan of all Boston sports teams, and is equally willing to talk about about last night’s Celtics game as he is to discuss complex legal issues.